Structures of the Great Wall of China (of the Ming Dynasty). Structures of the Great Wall of China (of the Ming Dynasty). The Great Wall of China today is known worldwide as a huge defense system, usually thought of as a nearly impenetrable and continuous wall manned by masses of soldiers. In reality however, it was not always quite that magnificent. 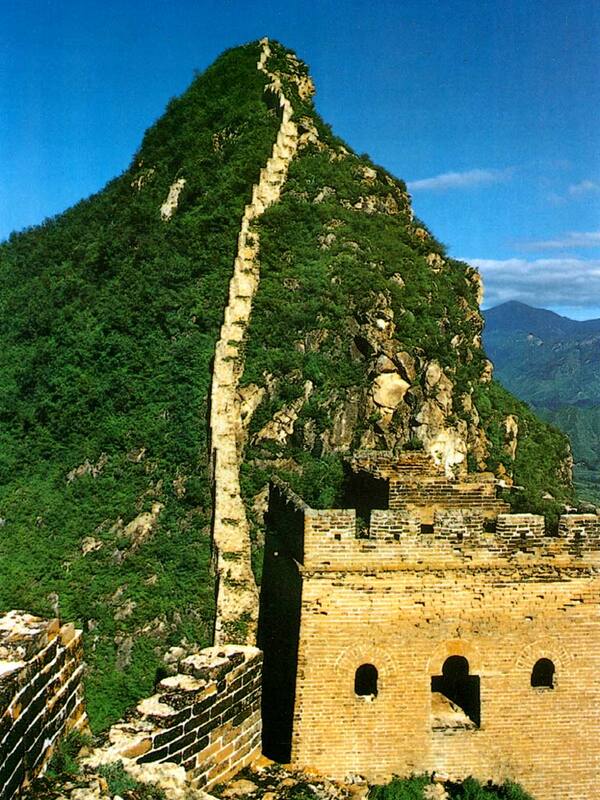 Construction on the Great Wall of China began as early as the 7Th Century B.C. in a time known as the "Sping and Autumn Period". According to the Wilson Chronology of Asia and the Pacific: " As the Xiong-Nu (ancestors of the Huns) began to gain strength in the north and west of China, and to raid into China, several northern Chinese States began to build protective defensive walls against the raiders (before 400 B.C. ), while in the same period attempting to build marital alliances and placate the raiders with gifts ". As the United Nations UNESCO organization holds it; " The principle of these extraordinary fortifications goes back to the Chunqiu period (722-481 BC) and to the Warring States period (453-221 BC)". In this period of Chinese History, although officially central powers were still intact and the Eastern Zhou Dynasty held sway over the Han peoples realm, in reality the Zhou State was increasingly frought with internal strife resulting in the forming of several states (kingly realms) within. One of these states vying for power and influence was the State of Chu, a rather militaristic state situated in south and central China. It is the State of Chu which is known to have built a large square (fortified) city, a first walled defense, which today -in China- is taken as the first beginning of a "Great Wall of China". Its is for this reason that the Chinese sign for "City" = 市 , is also the sign reserved for The Great Wall of China itself. 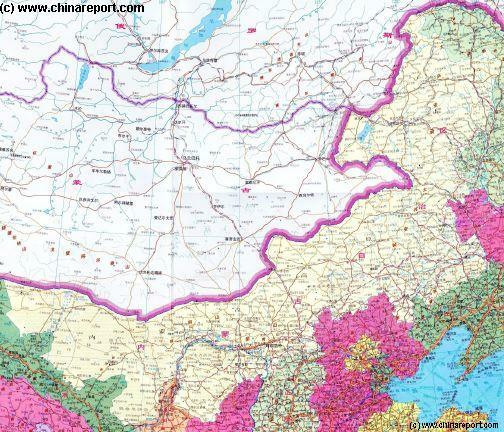 A schematic overview of North-East China's Hebei Province entire, delineating Provincial Borders and parts of neighboring Shanxi-, LiaoNing- and Shandong Provinces and Inner Mongolia Autonomous Region. The Map clearly marks the location of Qinhuangdao and gives an overview of the remaining Great Wall sections in the surrounding regions. picture, however as most first time visitors to China's Great Wall will find themselves visiting one of the Ming Dynasty Era Great Wall sections (often near Beijing), this review of the many various structures found along the Great Wall must start with this main outline. 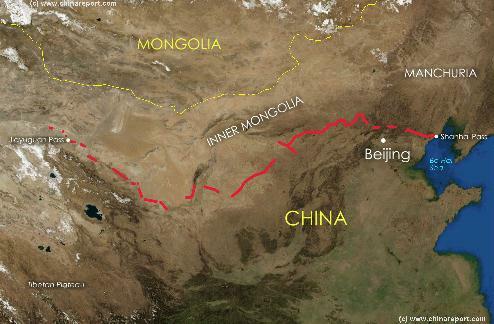 Generally speaking, the Great Wall was built along the highest (and therefor hardest to climb) mountain ridges, or otherwise across vital rivers and communications points such as the mountain passes. In so doing, the path of the Great Wall interlinked otherwise remote border area's (counties) into one long communications and defense system, bringing all - in a sense- closer together. This Wall then, forms the backbone of the larger defenses that should be considered as part of the Great Wall of China defenses. The general purpose for the Great Wall of China to be build along the ridges of mountains is that these "lines" were very hard to reach for Cavalry men. Or, in fact in many places, for any army or person on foot. The Wall that was then built on top of the highest and most continuous ridges then only added to the barrier to invading armies. In the further goal of defense many variations of defenses were applied, often depending on the local situation. could live and eat, defend themselves and which could be used as platforms for archers and from which the besieged could send warning signals to nearby towers and alert the rest of the Wall. In principle, especially among the line in the North and North-East, the Wall only comes down from the mountain either to interlock with a Mountain Pass Gate, a Fortress City or to intersect with a river. In so doing the Ming Dynasty Wall provided a nearly continuous line of defense. On the Wall, in front of the Wall and in strategic positions in direct sight of the main line of the Great Wall, additional methods of defense were applied. Many of these defense methods and the structures involved are described below. To enhance the defensive functions of the Great Wall, trenches were dug along the exterior of many sections. Starting with the earliest recognized Great Wall of the Qin Dynasty Era (221 B.C. - 207 B.C.) all the way through to the "Last" Wall of Ming Dynasty, this was a common practice. The trenches were an insurmountable barrier for any band of cavalry attacking, and usually it helped slow down the foot-folk while they were in range of the weapons of the defenders atop the Wall. Literally, the First of all Gate Cities set along the Great Wall is Shanhaiguan, a fortified town set in the middle of a crucial pass (and road) acting as a hardened Gate, and exclusive passage point along an otherwise forbidden and impenetrable Great Wall. The Shanhai Pass City, a sizable fortress Town in its own day, can still be visited and toured today (See: Shanhaiguan). There are however many others, big and small set along the length of the Great Wall nearly throughout China (P.R.C.). "Structures of of the Great Wall of China - Pass Cities". unrecognizable due to the length of time passed and damage and erosion occurring. A noteworthy part of the Ming Dynasty Era (1368 A.D. - 1644 A.D.) Great Wall can be found at the Fortress City of Datong in North Shanxi Province. 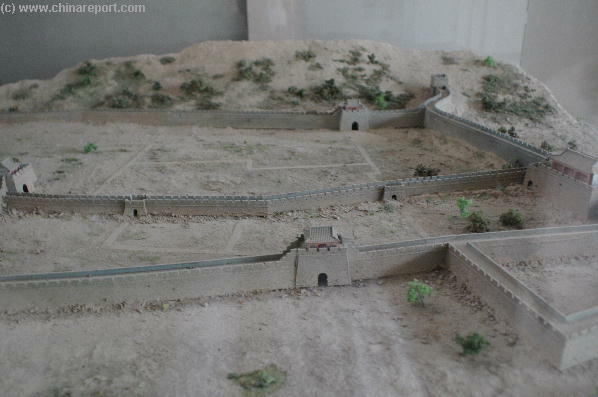 At Datong, the City Wall and Gate of the Great Wall were protected by a very deep and wide trench. However in this dry and dusty location it could not be filled with water and turned into a moat. Datong City was not protected by an outer moat (as in the case of Shanhaiguan), instead the City Walls only had a deep gully, of which it is known that the opposite side was planted with trees, probably in order to hold steady the loose (loess) soil of the banks. The exact location of this moat is untraceable today although renewed efforts are underway as Datong renovates its Ming Dynasty Era City Wall to serve as a tourist attraction. At the Shanhaiguan City Fortress at the coast in Qinhuangdao City of Hebei Province one can still see parts of the moat, providing a vivid illustration of what they were like in the heydays of the Ming Dynasty. At Shanhaiguan there was no lack of water as two rivers run past in the vicinity of the ancient city. The main river is the Shi River (Da Shi He), which flows some ways west of the Fortress. The waters of the smaller Chaohe were diverted to be used to fill the moat of the "First Gate under Heaven". In this sense the Chaohe was the border river which had to be crossed before heading forward in either direction. Pass Cities and Castles built at essential communication spots were vital components of the Great Wall of China, throughout all Era's. The most notable and large scale representatives of this planning of the Great Wall are the often massive fortifications built at the passes, and the intersections with rivers were the Great Wall is linked across. On a much smaller scale smaller fortresses reinforced minor passes and side passages. The Fortresses themselves were flanked by additional walls and fortifications all lined with troops that could together deal with a large scale incursion. The strategic choices made in the planning of construction often filter down to the lowest levels, and where possible the Wall would be along essential rivers and water wells, especially in the more arid Western Regions. This crucial strategy comes to its most pointed expression west of Dunhuang and the Sun Gate (Yanguan) Fortress City where the Han Dynasty Era (206 B.C. 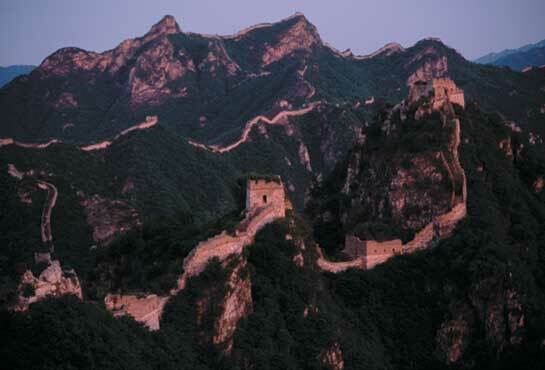 - 220 A.D.) Great Wall was extended into the Lop Nor Desert by means of Five Fortresses and Fire-Beacons. By building the Fortified Beacons right next to the only five available water sources in the wider regions, the Han managed to remarkably improve the effectiveness of their beacons (and the Wall). The point was quite simple; anyone who ventured into the area, must eventually run out of water. At that moment they would be faced with the choice either to retreat, or replenish their water and expose themselves to the alert system of the Great Wall. Guards were on alert overlooking the water's edge day and night and anyone trying to sneak in for a drink was likely to be caught red handed. Beacon Towers for the purpose of signals communications were built on either side of the main body of the Great Wall as well as between the Great Wall and main county or prefecture level towns, as these towns were usually fortified and had smaller or larger garrisons stationed. Beacon Towers were often built high on hilltops in especially strategic locations from where on could overlook vast area's of the surrounding territories. They are especially numerous along crucial mountain passes along the length of the great wall, where they were placed in forward positions usually in direct site of the Great Wall. In other cases Beacon Towers and signal platforms appear miles away from the Great Wall itself. When one takes a cross section of the Great Wall of China one will find that it is built in the shape of a trapezium. The trapezium, with its wide base is proven to be a stable structure and was therefor chosen as the main model on how to build the Great Wall as a solid and immoveable structure. As a clear model that can be visited, viewed and inspected today, the restored Badaling Great Wall of China north-west out of Beijing can provide an excellent example. At Badaling the main wall is 6.5 meters wide at its base and 5.8 meters at the top. It is a very thick and solid wall situated on a strategic location of the highest rank. Someway's further to the East, the now equally famous Jinshanling wall section found north-east of Beijing in Luanping Township of Miyun County of Hebei Province, measures 6 meters at the bottom and five meters wide at the top platform. Yet another section, the Juyong Pass (Juyongguan) Great Wall, part of an Inner Layer of the Great Wall serving as a Gate beyond the Badaling Fortress, measures but five meters at the bottom and a narrow two meters wide at the top platform. This illustrates that the basic form of the Great Wall of China is always in the shape of a Trapezium, symmetrical across and wider at the base to provide stability. However, the exact measurements of the Great Wall itself can vary according to location. The "Greatness of the Wall" depends much on the expected threat level, and is adapted to local terrain and circumstance. The height of the Great Wall of China was on average about 7 to 8 meters high. There are however many remarkable deviations from this general scheme. Other sections (originally) only measured between 3 to 6 meters in height. Again generally speaking, the Great Wall was higher when it was built on lower or flat terrain (such as in- and near passes), and was less high (and thick) when it was built on higher more treacherous terrain. It makes little sense to build a very high wall on top of a very much higher mountain ridge or top. In many places the Great Wall of China has but one layer. That is there is one wall, one line of defense plus some watchtowers and castles. However, in the Ming Dynasty Era the Wall evolved into a massive Fortress. In the centuries of the Ming Dynasty two layers, and sometimes three layers of the Great Wall were constructed, usually in area's with an especially high threat and/or a special strategic position. 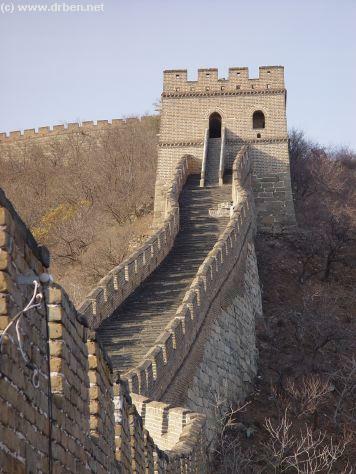 A second, much overlooked aspect is the longitudinal defense provided by the ladder shape of the Great Wall. As one can observe clearly on most famous iconic images of the Great Wall of China its climbs the mountain ridges as a ladder. This is also why the Chinese overtime have come to liken it to a Dragon. The ladder forms the "Scales of the Dragon". What is a little less clear, until one scales the Wall, is the construction of ladders between ladders. In practice this means means that the Wall itself climbs at a steep angle while it connects from platform to platform taking big leaps. Between the platforms, the communications gap and freedom of movement is narrowed by having small stairs connect the platforms together. The Stairs are often not wide enough for more than 1 or two persons to pass at a time. In this ingenious way, once the enemy managed to take one small part of the Walls, one platform, the defense was in many ways maintained by enabling each platform of the Wall to become its own little Bastion. As soon as the defenders retreated to both sides, the invading enemy would become stuck between two fires. That was still a precarious situation and advantageous to the defenders. The platform taken by the enemy would become a kill zone. The only ways of escape would be to fight uphill and squeeze along the ladders, or - as the Chinese would hope, choose a humiliating retreat down the Wall. Some outlying sections of the Great Wall have ingenious structures to further enhance defense using this ladders on the ladder strategy. Ladders of the Great Wall at Mutianyu, outside Beijing. A Full Google Earth Supported Map of ShanhaiGuan Fortress City by DrBen.Net. Classic iconic Image of an exteme hilltop section of the Great Wall of China. Full Google Earth Supported Map of Jiayuguan Fortress & Spring Lake by DrBen.Net. At other points, the Great Wall simply includes a number of Main Water sources, thus keeping them unavailable as the water source for any large army arriving. This is the case at Jiayuguan - in the Ming Era the First Gate Under Heaven in the West, a place where the best water source available, known as spring lake oasis, sits right underneath the Walls of the Fortress City itself. At the other end of the Great Wall, in the East, the "First Gate" of Shanhaiguan repeats a similar pattern, with the main river set behind and on the inside of the Fortress, and the second available river, the Chao He, having been diverted and canalized in order to serve as a Moat for the Fortress. chosen for his planned invasion of the Chinese heartlands, before his demise from a Battle wound. The particular attraction and value of the strategic point at Zhongwei are the calmly flowing waters of the Yellow River (Huang He). These waters would have been the first destination and goal of any army making it alive through the Desert. All that lay between the Desert sands and the Yellow River was a narrow stretch of green land created by the waters and full of grass and plants able to feed the horses. Hence, in the Ming Era a Great Wall section was built here in order to block direct access from the Desert to the River. Several battles followed over the centuries proving the worth of this large investment. The Wall can be divided into two general categories: double-sided and single-sided walls. The double-sided wall refers to two layers built at the top of the wall. One layer is about two metes high with crenels (holes) built at the outer top edge. This is called the Battlement Wall. The inner and lower wall, which is about one meter high at the inner top edge, has no crenels. This is known as a Parapet. 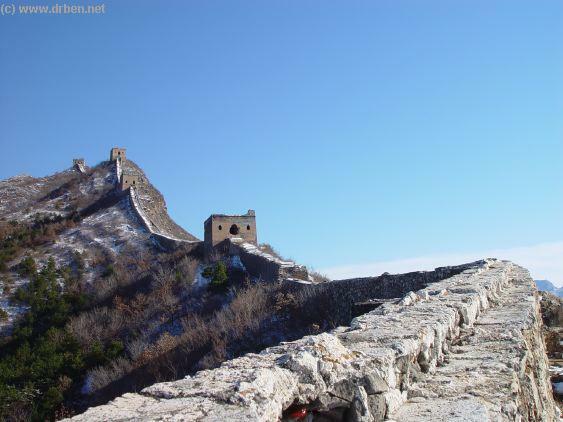 Double-sided walls are frequent in the entire ring of the Great Wall surrounding Beijing, and can be seen at Badaling, Mutianyu, Jinshanling, Simatai and other sites, all the way through to the north-eastern end at Shanhaiguan and Laolongtou beyond. 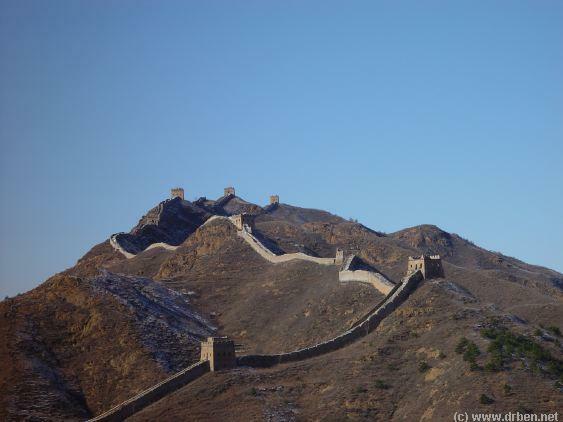 One can divide and categorize the Great Wall of China Sections from the building materials used in their construction. In this way their are 6 categories: earth, stone, brick-stone, palings, cliffs and cliff-palings. "Structures of the Great Wall of China - Clay, Stone, Brick and Mud Walls". All the Gates were hinged on the inside of the Wall near which brick or stone stairs led to the Wall's top and troops. On top of the Wall various facilities and structures were built in order to keep the troops safe when engaging in Battle. Parapets were built on top of the wall along the inner sides, their main function was to keep soldiers from falling down from the Wall to the ground. The battlements in turn were built along the outside of the wall facing the enemy. Above the battlements are gaps known as "peep breaches". Under the battlements embrasures are available for shooting arrows, stones and the like. "Structures of the Great Wall of China - Fighting Platform and Watchtower". To prevent erosion of the wall from the rain was an important requirement which had to be taken into account in the construction planning of any section of the Great Wall of China. To keep the wall in prime condition its foundations must remain strong and solid. Therefor, the workers who built the great wall included long gray bricks on top of the wall to act as a gutter system. The outlets of the gutters were small holes on the inside of the wall. The holes through which the water could poor out where then extended by inserting pottery pipes, or clay half pipe stones (slabs) which, thus attached, could bring the water well away from the body of the Wall. In this way, whether raining, pouring, snowing, freezing or thawing the body of the Wall remained untouched and thus undamaged. By use of the gutter-system, the water could not sink into the wall to erode it from within (especially freezing and defreezing of water can split rock). By use of the water-sprouts and pipe systems to lead falling water away from the Wall large scale erosion of the base and foundations were prevented. In ancient times many Towns were built on either side of the Great Wall or not too far from it. They were called block cities, and were fortresses or castles. No matter which is their particular name their function was always the same, namely to serve as station for garrison of troops. Surely, their may have been many civilians living among the soldiers inside or near the City, in essence the majority of their population consisted of armed troops. Some fortresses and castles had beacon towers so as to combining defense with signal and communications functions. Any proper headquarters is useless without communciations afterall. Therefor, in the line of the Great Wall during the Ming Dynasty Era, Fortresses, block cities and castles did not so much serve as a first line defensive works but more as a (massive) barracks for stationed troops, usually in remote regions. "Structures of of the Great Wall of China - Block Cities and Castles". A Beacon Tower was building used to deliver military information by producing smoke or by lighting a fire. The fuel that was often used to make the smoke was Wolf Dung (feces), which when dried produced an especially thick visible smoke. Soldiers were organized in order to collect the dung. Due to the whole process involved the Beacon Towers were also known as Wolf-Smoke Towers. In the very earliest history of the Great Wall of China, in the time of the Eastern Zhou Dynasty in the 8Th Century B.C., the Wall was not in any way continuous and thus the Zhou depended heavily on Beacon Towers for their defense. The towers themselves had little fighting chance against a large army, but by using signals that worked over long distances, the Zhou remarkably improved their response time and military effectiveness against roaming bands of "barbarian" cavalry. As time progressed and capabilities evolved, the Beacon Tower was developed in form and shape until it lost the potential for further improvement. This process can be followed by studying and visiting the various beacon towers erected in the Qin and following Han Dynasty (206 B.C. - 220 A.D.), roughly between the 3rd Century B.C. and the 3rd Century A.D. Some of the still remain, eroding away in remote regions. Many centuries later, during the successful Tang Dynasty (618 A.D. - 907 A.D.) , borders eventually shifted far beyond the Great Wall of China, which was then slowly neglected until its gates crumpled. In the last century of the Tang Era no construction work nor proper maintenance was done on the Great Wall itself, however the construction of Beacon Towers still progressed. Especially helpful to give warning over long distances and for communications purposes and guidance along major roads (and passes), the Beacon Towers formed much of the active backbone of the Great Wall of China, and in fact the entire Imperial Machine a that time. The Great Wall not so much served to keep out, but to control and when necessary keep in. The watchtowers, visible wherever one went within the border lands, represented the power and presence of the Empire. It made the lands feel Chinese and that gave a reassuring feeling. As with all structures along the Great Wall, the construction, use of and management of the Beacon Towers was fully preplanned and worked out in detail. Naturally, the communications followed a standard procedure that was the same in principle for every tower along the entire length of the Wall. The last time the Great Wall was rebuilt and expanded was well after the final demise of the Tang Dynasty (in 907 A.D.) and a subsequent massive invasion and occupation by a Foreign Peoples. More than a hundred years after their invasion these people, the Mongolians and associated tribes, were throw out by the Han Chinese, thus establishing the Ming Dynasty and igniting a new phase of construction along the Great Wall of China. In the following period, between 1368 AD and 1644 AD, a now paranoid Han Chinese Nation managed to construct a Great Wall that was nearly continuous in its defenses and more solid and massive than any seen before. The Beacon Towers built in the Ming Dynasty thus are also the most solid beacon towers found along the Walls of various era's. Today, most of the remaining ruins of Beacon Towers date from the Ming Era and the best preserved ones are Ming built towers. "Beacon Towers and Communications of the Great Wall of China". Spectacular Simatai Great Wall, a rare single-sided wall section in Beijing Province. mountain ridges where there was no space for a full sized wall. The classical and easiest place to reach and view such a wall is due north-east of Beijing a the spectacular Simatai Great Wall section. At Simatai, the Great Wall first interects with a river, after which it climbs back to the mountain tops along a steep ridge. After but few watchtowers, the wall meets a solid granite wall which its crosses culminating into a frighteningly narrow, high and precarious path along the very top. (In fact, the last part of this section has become so dangerous that tourists are no longer allowed to walk the last crumpling ruins of the wall). 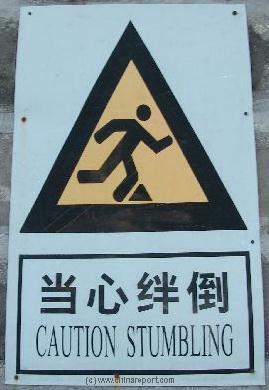 The "one liner" at Simatai Great Wall, a dangerous and now forbidden walk. Google Earth Supported Map of a Smoke Oven or Smoke Chimney Site in Ningxia Hui Autonomous Region, by DrBen.Net. Once the enemy arrived and attacked, the first to observe the enemy would the occupants of the watchtowers. If procedure was handled correctly, their first action would have been to give off a smoke signal thereby communicating the arrival of the enemy and the need for reinforcements. The signal would then be picked up by adjacent watchtowers and would travel along them to reach the Wall. When necessary, from there horse-riders would relay messages further into the interior and if need be the nearest city could be alerted on a very short notice, bringing the entire region and its defenses into play. Beacon Towers for signaling smoke can be found all along the length of the Great Wall of China but singular platforms dedicated to the sole purpose of lighting beacons are the most common in the Western Provinces. In the far West they appear beyond the Great Wall of China itself, extending some of its reach as well as functioning as guiding beacons for travelers on the Chinese Protected parts of the ancient Silk Road. are unprotected (no fortification) are exclusively found behind and on the inside of the Great Wall. Surviving smoke pits are rare today. pass north and around the City of Beijing. 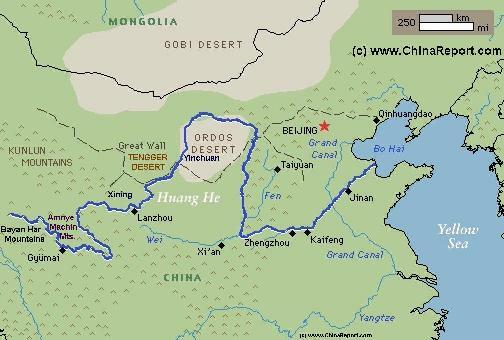 natural barrier formed by the Great Yellow River at Old Ox Bend (Liaonu Wan) in the West and the fortified Cities of Shuozhou and Datong in the North East. Apart from the outer layer of defense running from Old Ox Bend towards Datong, the Inner Layer has two walls which lead to the City Fortress of Shuozhou. Within this southern double walled layer, there are even splitting points that add a fourth layer to the total near crucial passes. Multiple layered Walls to ensure impenetrable defenses along especially vulnerable sections such a low lands, mountain passes and along main roads (Photo: Great Wall Museum at Jiayuguan UNESCO World Cultural Heritage Site, Jiayuguan City, Gansu Province). Pass City (Juyongguan) which also provides the strategically placed garrisson fortress that held all of the strategic back up for this Gate to Beijing. On the Eastern side of Beijing, in Tangshan Prefecture and Qinhuangdao Prefecture of Hebei Province, double layers are also featured at several points. These are however located far out into the remote countryside, and take some planning, time and effort to go visit and see. Even more spectacularly, especially in North-Western Hebei Province in Zhangjiakou Prefecture - along the route from Mongolia to Beijing known to Mongolians as "Heaven's Gate" (Kalgan), it is known that a total of 12 layers were built in an effort to fortify the whole region against the massive Mongolian attacks. Other regions are supposed to have a record breaking 20 layers of Wall. ----> The exact locations are currently under research by DrBen.net - China Report.com but are likely found in Northern Shanxi Province where defenses are especially thick and widely distributed. -Please check our Great Wall of China Map for details.- As can so far be reported, defenses around Zangjiakou are spread over a wide geographical area, and the Wall itself has mostly disappeared. 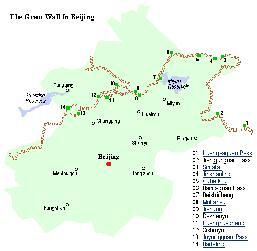 A Last section that maybe noted is the Great Wall in Ningxia Hui Autonomous Region. Although not a double Wall per se, the Ningxia Plain of the Yellow River is usually mentioned because its has three walls. It was in this lengthy and painful episode in Chinese History that the first real defensive Walls evolved, both as a marking of the borders between neighboring states and often as defensive walls hoping to exclude a hostile army. Thus, the first "Walls of China" were built by the States of Chu and its smaller and frightened northern neighbor Qi. Some of the ruins of these very early walls can stil be found in south Hebei Province, Shandong Province and south Shanxi Province. The Wilson Chronology of Asia and the Pacific mentions that in the period between 300 B.C. to 250 B.C. "Chinese engineers built an early earthworks version of their Great Wall, at the terminus of their Imperial Highway, approximately 250 to 300 miles west of Chang'An (Xi'An) in the Wei River Valley". Although this is not mentioned this was probably done by the expanding State of Qin. In the same period other States such as Yan, Zhao and Qin built defensive walls along their exterior borders in order to keep out nomadic armies from the north. Remains of their walls can still be found today within Liaoning Province and in Inner Mongolia Autonomous Region near Hohhot (see: Map Great Wall - Layers & Era's). These very first walls marked a modest beginning which led to the creation of the first true Great Wall of China. Subsequently, all walls previously built were united in the short but influential Rule of the Qin Dynasty (221 B.C. - 207 B.C. ), who united not only China (all Chinese States) but embarked upon the unprecendented building of walls, uniting all defensive walls built previously during the Warring States Period into one giant structure. According to the Wilson Chronology of Asia and the Pacific: "Qin builders completed the first unified version of the Great Wall (of China) (in) 210 B.C., defending China against the Xiong-Nu and their allies, while Qin armies defeated Xiong-Nu Forces in the field, though the war would continue." 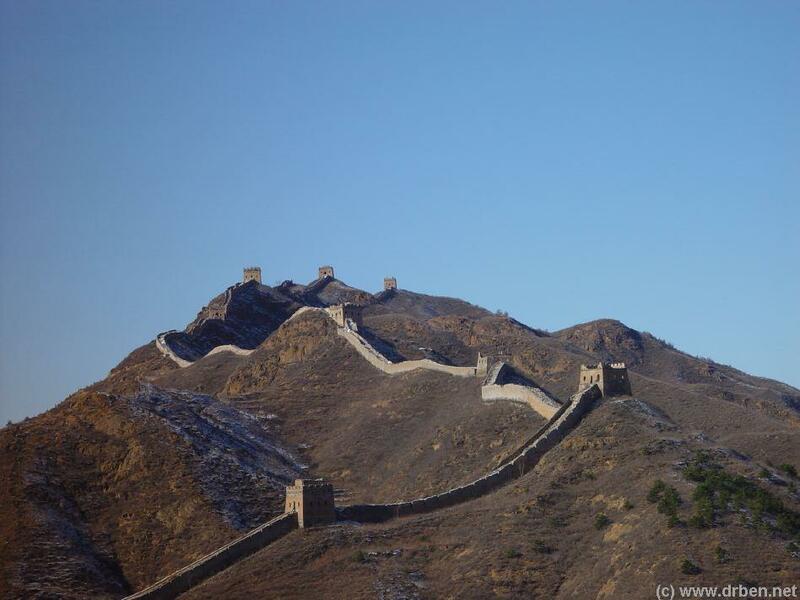 This Wall built on orders of Emperor Qin is described to have been "10.000 Li" long (which should be taken as symbolic for "very long") stretching between southern Gansu Province in the West all the way to Pyongyang on the Korean Peninsula in the East and it was the first version of what is today understood as the Great Wall of China. Construction of the Great Wall of China continued with intermittence for the next two millennia, being undertaken during the succesful Han Dynasty (206 B.C. - 221 A.D), the Western- and Eastern Jin Dynasties (265 A.D. - 420 A.D.), the Northern Wei Dynasty (Also known as Tuoba Wei)(386 A.D. - 534 A.D.), the Northern Qi Dynasty (550 A.D. - 577 A.D.), the Northern Zhou Dynasty (557 A.D. - 581 A.D.), the Sui Dynasty (589 A.D. - 618 A.D.), the Liao Dynasty (Khitan Empire - 907 A.D. - 1125 A.D.), the Jin Dynasty (1115 A.D. - 1234 A.D.) and finally the Ming Dynasty (1368 A.D. - 1644 A.D.). A first true defensive wall of one nation against another appeared in roughly the same period, as the UNESCO says: "The construction of certain walls can be explained by feudal conflicts, such as that built by the Wei in 408 BC to defend their kingdom against the Qin". As the military successes of Chu piled and smaller neighboring states were absorbed into the Chu Realm, the policy of building walls was extended across this growing Kingdom and in due time real defensive walls were created in strategic points. That is, as turmoil in China continued, the Zhou Dynasty (1121 B.C. - 255 B.C.) finally terminated flinging the already fragmented realm into its next painfull episode marked down as the "Warring States Period". During this "Warring States Period (475 B.C. - 221 B.C.)" arms races were the norm while the 6 Kingdoms left within Han China after the demise of the Zhou battled eachother for centuries in an utter War of attrition. By the time of the Ming Dynasty the Great Wall had finally evolved into its most solid, most effective and most impressive form stretching across no less than 15 Chinese Provinces and comprising a total of 50 thousand li, around 25.000 kilometers of Wall. It was an is one of the greatest cultural and architectural achievements in all of human history. The Great Wall of China in the Ming Dynasty was a "10.000 Li" (very long) long defense line, composed of the main element of a defensive wall in combination with other structures such as entrenchements and moats, fortifications and double walls, pass cities, block cities and castles plus watchtowers and beacon towers. To get a better understanding of all structures involved in the creation of the complete defensive work that the Great Wall of China was, please read through below Chapters. 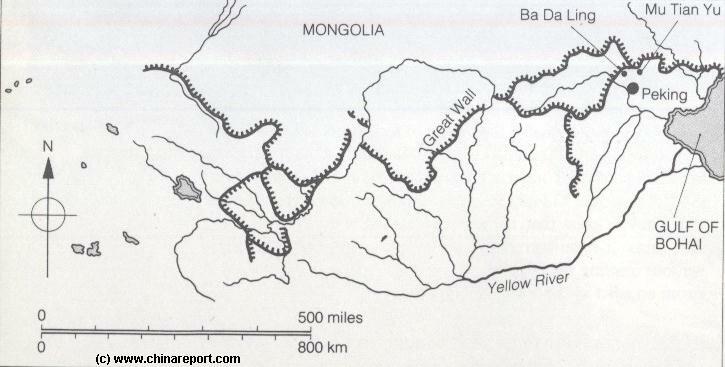 Schematic Map of the Flow Path of the Yellow River through China and its intersections with the Great Wall of China (Thin Grey Line). One in the West at the Tengger Desert, One in the North closing the Gap between mountains, desert and Yellow River, and lastly: a third one in the East to cordon off the south rim of the Ordos Desert. 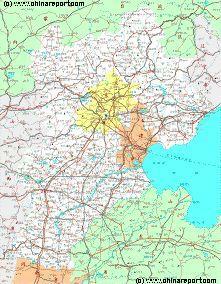 The fortified cities in these western regions were Yulin (Shaanxi Province) and Yinchuan (Ningxia). Furthermore, a double walled section can be found along the stretch of the Great Wall between the Yellow River (Huang He) and Yanchi, a county Town on the Shaanxi-Ningxia border. In the middle of these sections, known as Shuidonggou and Yanchi County Great Wall a clearly recognizable double layered section of a mud built wall of the Ming Dynasty Era can be explored even today. The double layered section focusses on a Castle (Block City) which marks the border between Linhe County of Yinchuan Prefecture and the Yanchi County of Wuzhong Prefecture, both in Ningxia Hui Autonomous Region. along the west bank of the Yellow River and can be walked as far as one dares or can muster.